Posted January 3, 2017 by sdrexler-admin & filed under Forged Documents. The Church of Jesus Christ of Latter-day Saints, also known as the LDS Church or more commonly as the Mormon church, has been rocked by numerous scandals throughout the years. One of the church’s biggest scandals, though, took place back in 1984 and involved what was known as the Salamander Letter. This letter that appeared to include correspondence between early Latter-day Saints convert Martin Harris and W.W. Phelps, one of the first leaders of the Latter-day Saints movement, and it seemed to allude to the true origin of the “gold plates” that founder Joseph Smith used to put together the Book of Mormon, the sacred text used by the LDS church. Specifically, the letter suggested there was a magical component to Smith’s discovery of the plates, says Times and Seasons, which would have rocked the LDS community at the time. In the letter, a salamander spirit was believed to have been guarding the plates and demanded that Smith bring his deceased brother to him to get the plates. This implied that folk magic was involved in the early development of the Book of Mormon – not simply just a practice that Smith abandoned earlier in his life. If true, this letter would have stirred an immense controversy in the beliefs of the Mormon church. However, in actuality, the letter was a forgery. Mark Hofmann, a notable counterfeiter and forger – who is currently serving a life sentence for attempted murder, as KSL Newsradio in Utah notes – approached LDS leaders and told them he had “found” documents that would portray the church in a negative light. He then attempted to sell many of the documents to the church since he believed they would want to hide them and prevent LDS followers from accessing them. He was successful in selling many of them and, for a time, there were church leaders who believed the Salamander Letter to be authentic. Hofmann was such a skilled forger that the letter looked and felt like it had been written in 1830. According to a report from D. van der Reyden posted by the Smithsonian, Hofmann used some interesting methods to achieve the forgeries. For instance, he used hydrogen peroxide – the same that may be in your medicine cabinet – to create an artificially aged look through oxidization. However, as the report says, his forgeries became suspect when high-power magnification showed the ink was cracking strangely on the documents and in a manner inconsistent with what would be expected from authentic aging. But it turned out that the Salamander Letter was just the tip of a much larger web of deceit and deception. As the Deseret News discusses, documents are still being uncovered today that Hofmann had a hand in forging. He had forged perhaps thousands of documents, continuing to play collectors and document enthusiasts against one another for years until finally his past caught up to him, and after setting off pipe bombs that killed two and injured himself, an investigation by the Salt Lake City Police Department uncovered the truth. Hofmann’s attempt at duping the LDS Church with the forged Salamander Letter is a good example of just how far forgers will go to try and trick people, and the great degree of success that he saw is a prime example of how easy it can be to pass off a document as legitimate – at least to the untrained eye. 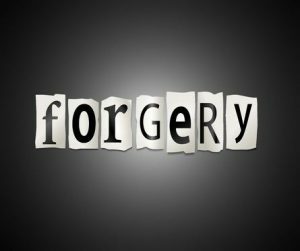 Fortunately, at Drexler Document Lab, we have decades of knowledge and experience and can examine any suspected forgery to try to validate it or prove its falsehood. Learn more by calling Drexler Document Lab at 844-373-9522 today.